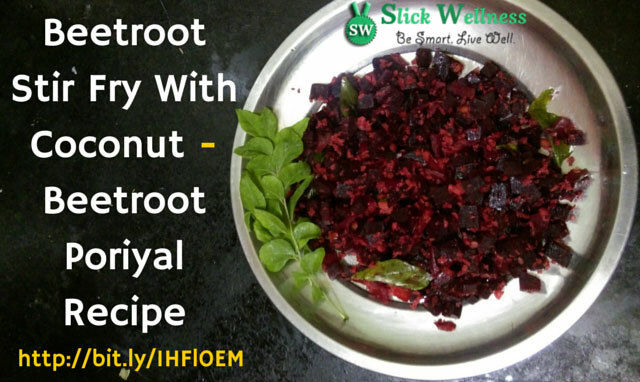 Beetroot is a highly nutritious vegetable. It has various health benefits. 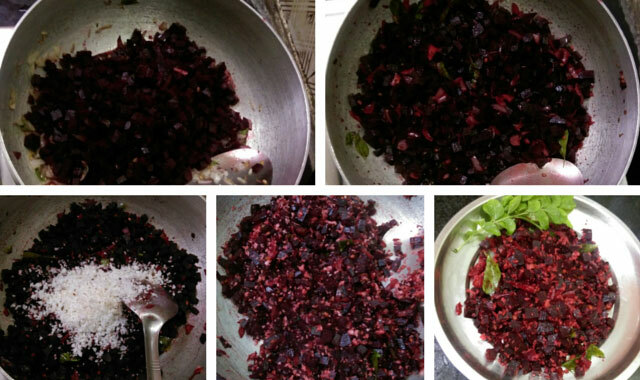 For one, beetroot is a natural antioxidant. It contains Vitamins A, C, B6, and Pantothenic acid. It also contains calcium, iron, phosphorus, manganese, folate, zinc, copper and selenium. Adding beetroot in your diet regularly will help you enjoy these vitamins and minerals and loads of other health benefits. This stir fry recipe will go nicely as a side dish with rice. The addition of coconut makes this dish richer. Beetroot is not high in calories – so you can eat as much as you want without thinking about the weight you would add on. Wash the beets nicely in tap water. Peel the beets and then either chop them or grate them. I chop the beets into small cubes. This recipe requires you to steam the beets first. 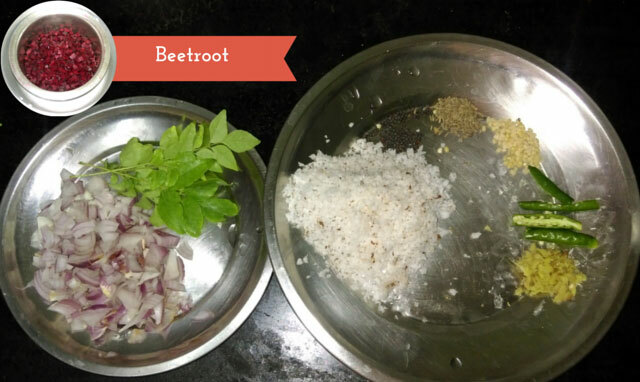 This not only reduces the cooking time a lot, but also makes sure that the nutrients in the vegetable are intact. Take a good sized pressure cooker and pour some water in it. 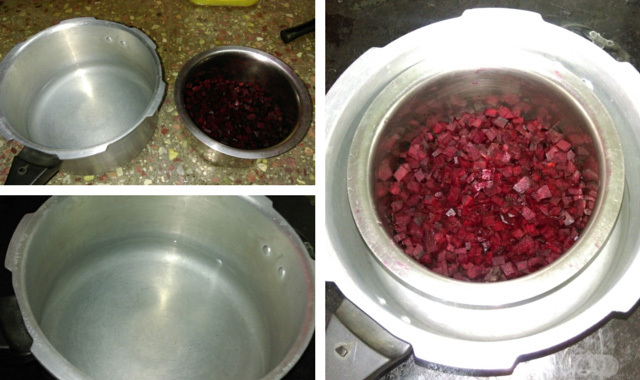 Take the chopped beats in a small silver bowl that will hold the beets and as well as fit inside the cooker. Close the cooker and steam the beetroot for 2 whistles. Set aside. Take a pan or kadai and add the oil of your preference. Once the oil is warm enough, add cumin seeds and urad dal. Once they start popping, add mustard seeds. Then add green chillies, ginger and curry leaves in order and saute for about a minute. Now add the chopped onion and required amount of salt and salute until the onion becomes tender. Add the steamed beetroot and stir fry until the beetroot and the rest of the ingredients mix well together. Then add the grated coconut and stir for another couple of minutes. Wash beets, peel and chop or grate them. Steam the beets for 2 whistles. 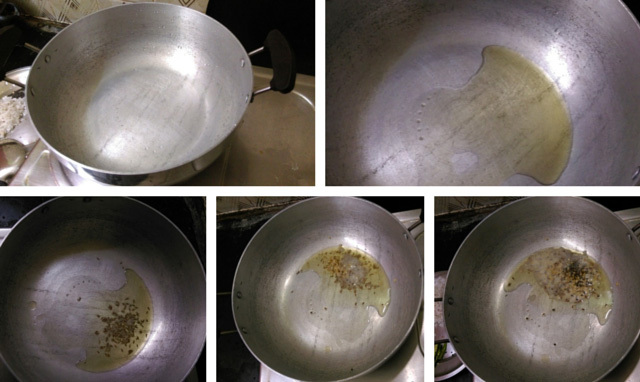 Heat oil in a kadai or pan and add cumin seeds, urad dal and mustard seeds. 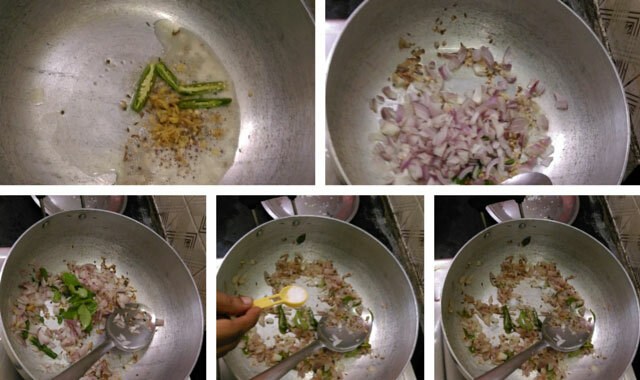 Add green chillies, ginger and curry leaves in order and saute for a minute. Add chopped onion and salt and saute till onion becomes soft. Add the steamed beetroot and mix well so all the ingredients blend well together. Stir fry for about 2 minutes. Add the grated coconut and mix well for another 2 minutes.